The 1974 film Chosen Survivors opens by introducing a nutty premise that just gets nuttier as it goes along. In the first scene, a handful of heavily sedated strangers disembark from a helicopter, wearing confused expressions. They’re placed in an elevator for a lengthy descent. At the bottom, they receive an explanation in the form of a pre-recorded message: They’re all part of a plan for “the continuation of the human race in the event of global thermonuclear war”—a war that’s now in progress—selected for “the special knowledge” each can “transmit to the future.” The good news: They now have an 18,000-square-foot bunker all to themselves, where they can live in comfort for up to five years until the threat of radiation poisoning has passed. As fallout shelters go, it looks pretty swank: It’s a gleaming metallic dorm filled with blinking lights and giant TV screens. The bad news: The TVs mostly give them a front seat so they can watch the end of the world. The really bad news: For all the thought and engineering know-how that went into making their post-apocalyptic safehouse, nobody thought about the bats. As the survivors—including a novelist, a congresswoman, a psychologist, and an Olympic athlete, played by a cast that includes Jackie Cooper and Diana Muldaur—figure out their place in the post-apocalyptic landscape, they engage in considerable handwringing and backbiting. But before long, they discover they’re not in a post-nuclear No Exit, but rather an especially high-concept disaster film, as they begin to fall prey to an onslaught of vampire bats. All the polished metal and cutting-edge technology left in the world won’t do them any good against the industrious winged intruders. 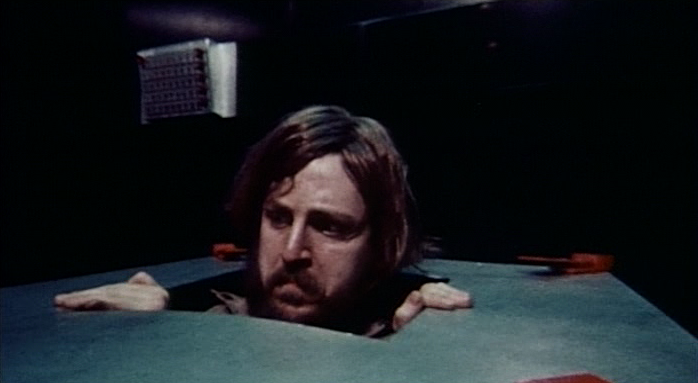 Once seen, 1974’s Chosen Survivors is pretty easily forgotten, nutty premise and all. It’s a poky, pedestrian movie that alternates between characters shouting at one another and not-so-scary bat attacks. And it invests a lot in a big twist that’s pretty obvious from the get-go. 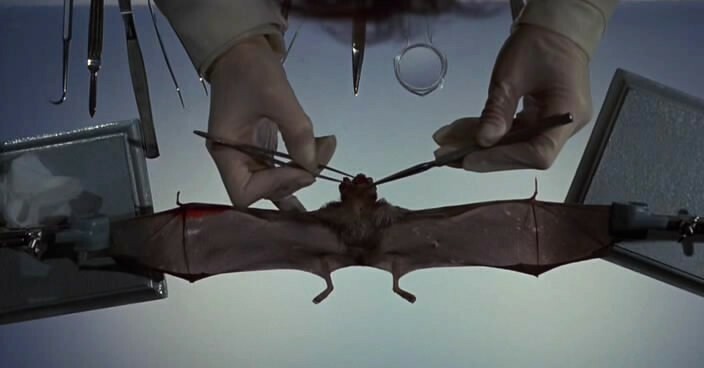 (Spoiler: Except for the bats, it’s all an experiment. No nuclear war has taken place.) But it also channels larger concerns: What if advances in science did nothing to stop threats to humanity? What if they led to parallel advances in misery? What if they introduced new, torturous forms of tedium? What if, in short, the future kind of sucked? There’s more than a bit of that feeling in the (previously covered) Silent Running, in which Bruce Dern’s protagonist finds he has more in common with the robots, flora, and fauna in his floating greenhouse than the troglodyte-like human companions with whom he’s floating through space. Or humanity as a whole, for that matter: Space has just given him the time and distance to contemplate his disenchantment from other people. It’s evident in the 1973 film Idaho Transfer, too. Peter Fonda’s second feature as a director, written by Thomas Matthiesen, concerns a group of Idaho-based research scientists who develop a device that allows them to teleport into the future. They subsequently discover there’s not much of a future to teleport to, the Earth having been devastated by some undefined crisis. Being enterprising young people (mostly played by unknowns with few or no other acting credits), the scientists hit upon a plan to keep humanity alive and protect themselves from destruction: Use the machine to colonize the future by bringing the supplies they need to survive with them. This proves problematic. Like Chosen Survivors, Idaho Transfer isn’t a particularly good film. (The fact that the public-domain version looks like a bad VHS transfer probably hasn’t helped its reputation.) But in spite of its amateurish acting and death-like pace, it has no shortage of interesting elements. One time-traveler injures herself in the future, and without the resources of civilization, even a doomed civilization, can’t treat the injury. Later, the visitors from the past discover that time-travel has made them sterile. Their great breakthrough has some bugs they hadn’t imagined, and they don’t have time to work them out. They’ve thought their way out of a problem and saved themselves from destruction, in the process earning themselves a longer, duller kind of death. Audiences weren’t exactly lining up to see that kind of future, however, even though Fonda regarded it as a passion project. Interviewed by the Pittsburgh Post-Gazette in 1976, he told the paper that the film only saw release in four states. “All my money was wrapped up in that film… I didn’t just bite the bullet on that one, I ate the goddamned thing.” The following year, viewers didn’t show up in great numbers for Dark Star, John Carpenter’s directorial debut, either. Later DVD and Blu-ray versions of the film came appended with a note from co-writer and star Dan O’Bannon that begins, “This movie is a comedy. I wanted to be sure and clarify that right up front, because when the film was first released to the paying public they didn’t seem to realize it was supped to be funny.” Elsewhere on the disc, O’Bannon talks about going with Carpenter to L.A. theaters and being disappointed by the sight of small crowds watching their comedy in silence. The sizable cult Dark Star has since attracted suggests it’s the viewers who were wrong, not the movie. Set aboard the Dark Star, a spaceship charged with destroying “unstable planets,” the film spends a long stretch on sending one of its astronauts, Sgt. 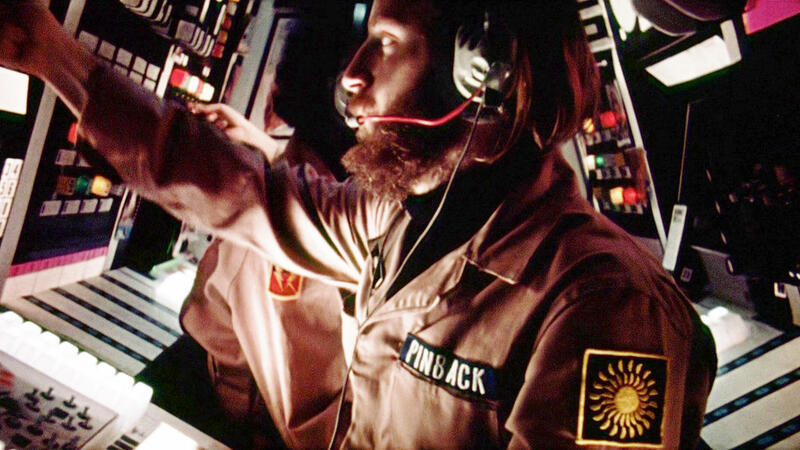 Pinback (O’Bannon), chasing an alien that’s clearly a giant beach ball with monster feet glued to its bottom. The climax has another crew member, Lt. Doolittle (Brian Narelle), attempting to defuse a bomb by introducing it to Cartesian philosophy. Somber, it’s not. Yet there’s also an uncomfortable plausibility to the movie that might have stifled the laughs. The longhaired, unkempt crewmen work in close quarters, and every word and gesture suggests they’ve grown sick of spending all their time in each other’s company. They probably smell bad. (Scratch that: They definitely smell bad.) Their living quarters are cluttered with junk. The pin-up girls staring down from the walls provide reminders of their sexual frustration. They’re irritable, unappreciated, and out of toilet paper. They’ve been given the stars, but the stars turn out to be just another place to grind out a living. And as ridiculous as that beach-ball-like alien looks, Carpenter makes it a credible threat in the first, expertly tense setpiece in a career that would be filled with them. Dark Star began as a student film, a collaboration between two USC film students that no one saw coming. In Shock Value, a study of New Hollywood-era horror filmmakers, Jason Zinoman writes, “They were very different types. O’Bannon, wound-up and intense, delivered a steady stream of bile, provocations, and paranoid theories. Carpenter was by contrast aloof and easy-going.” Yet both were small-town kids who grew up loving genre movies and made their way to L.A. with an eye toward making them. O’Bannon brought the absurdist humor and design sensibility; Carpenter brought the directorial muscle and the electronic music. The collaboration ended acrimoniously, but the project seemed to bring out the best in each, at least as long as they were making it. With Dark Star, both began their careers with a reaction to what came before. Dark Star is the unromantic opposite of much of the science fiction that preceded it, movies and TV shows in which clean-cut, solid citizens explored the stars. It’s also both a rebuke and extension of 2001: A Space Odyssey, offering none of the clean, white, sterile spaces of that film, but picking up its suggestion that space travel could be tedious. Dave and Frank, the two active crew members of 2001’s Discovery One, mostly just ignore each other, having long ago run out of things to say. Dark Star’s inhabitants might have reached the same point of silence if they didn’t practically live in each other’s laps. The bombs whose intelligence serves as a constant threat to the crew share a direct line with 2001’s HAL. They’re funnier than HAL, but no less dangerous. Both sell short a movie that packs a remarkable amount of ambition and innovation into every frame, and makes its limitations work in its favor. The too-small helmets the Dark Star’s space travelers wear are ill-fitting because they’re adapted from then-popular toys, but what should look ridiculous mostly suggests the general discomfort of space travel, particularly for those working for a heartless corporation. 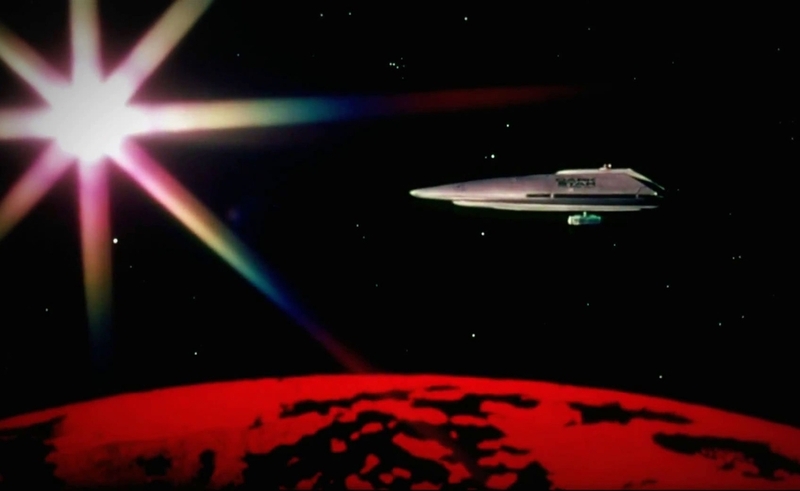 A sequence in which stars bend as the ship goes into “hyperdrive” was much-imitated, including by Star Wars, a film O’Bannon contributed to, and one that shares a similar flair for portraying space as a place with with a lot of wear and tear. Not everyone saw Dark Star, but it made a deep impression on those who did, and had a way of resurfacing throughout Carpenter and O’Bannon’s careers. The Antarctic scientists of Carpenter’s The Thing bear a strong resemblance to the crew of the Dark Star, and O’Bannon, frustrated by the film’s response, decided to rework some of its basic ideas into another screenplay centered on fatigued blue-collar space travelers, a heartless corporation, and a killer alien, figuring “If I can’t make them laugh, maybe I can make them scream.” That thought led to 1979’s Alien. Yet however rich its legacy, Dark Star has a resonant quality all its own, a blackly comic sense of exhaustion that suited the times. The moon landing had occurred just five years before the film’s release, and only two years before Carpenter and O’Bannon started work on the movie, which imagines the endless reaches of space as one big dead end, and the human instinct to explore it as just another waste of time. You can build a ship and send it to the stars, but in the end, it will all fall apart. That isn’t just the way of the world, it’s the way of the universe.